Bowman-Kintla Hike: This is a 38 mile horseshoe that begins at the south end of Bowman Lake and ends at the south end of Kintla Lake. The stand outs of this trip are the view from Brown Pass, the Hole in the Wall with its drop off to eternity and high alpine Boulder Pass. 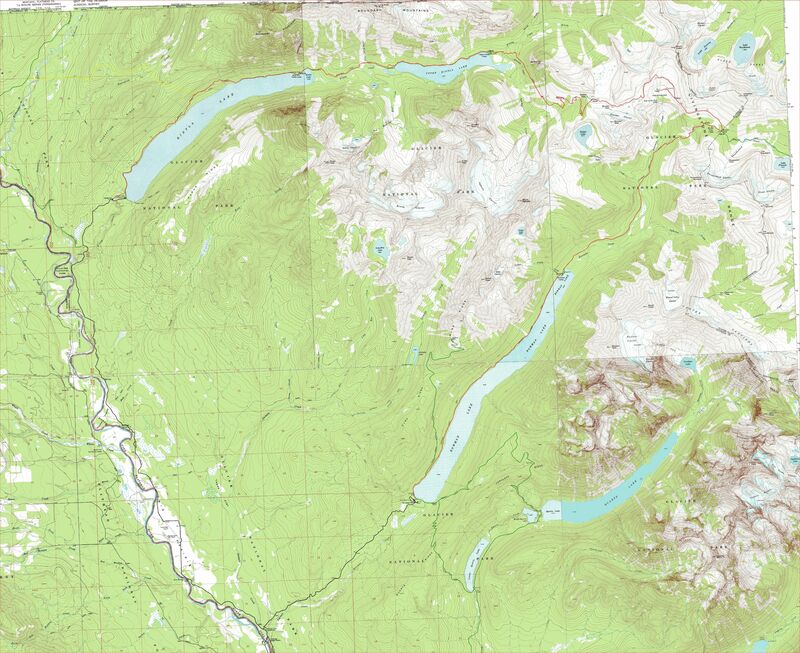 The Map: The map is 1:24,000 scale and based on the USGS 7.5 minute topo. Download it for free by opening it full size, right clicking and saving it to your computer. The GPS track (red) was taken on our trip in September 2008 and it closely follows the trail depicted on the original topo. Waypoints (blue) are provided that match with the narrative. 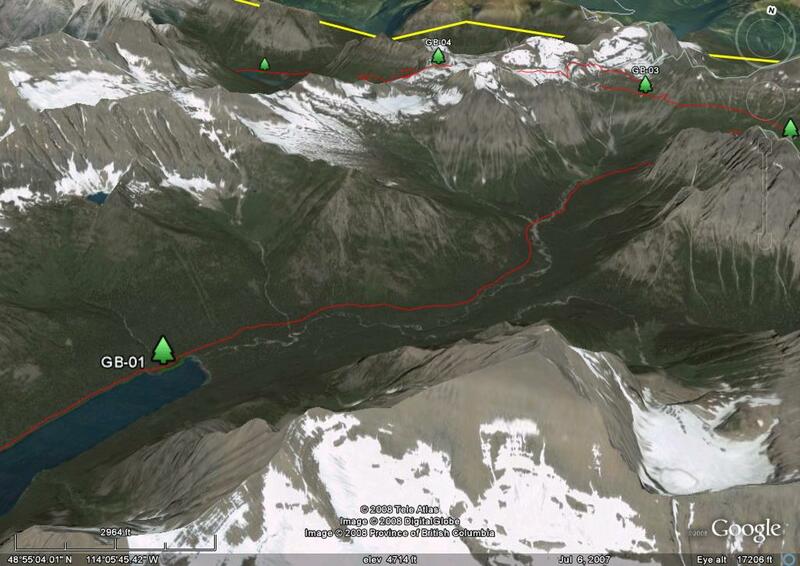 To avoid confusion, the miles used are based on the ones shown on the official backcountry campsite map. 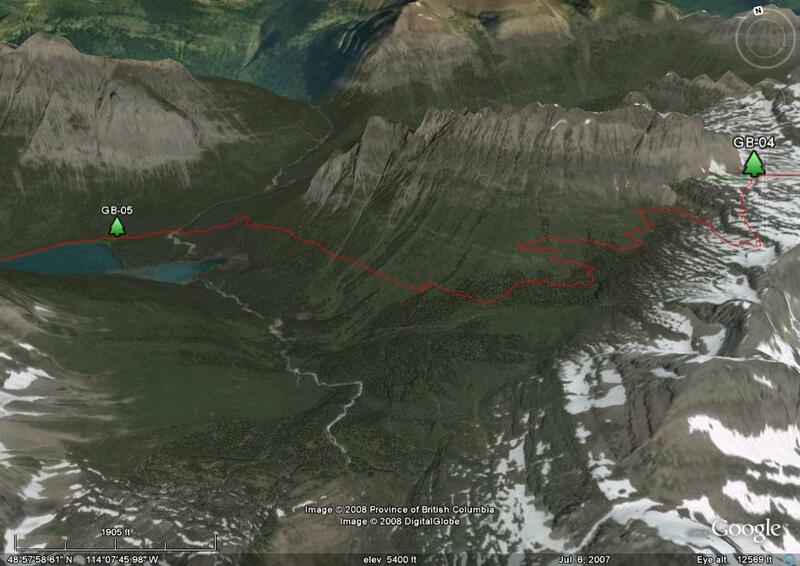 The green trails are camp ground spurs and other trails (it looks like there is nice overnight trip to Quartz Lake). 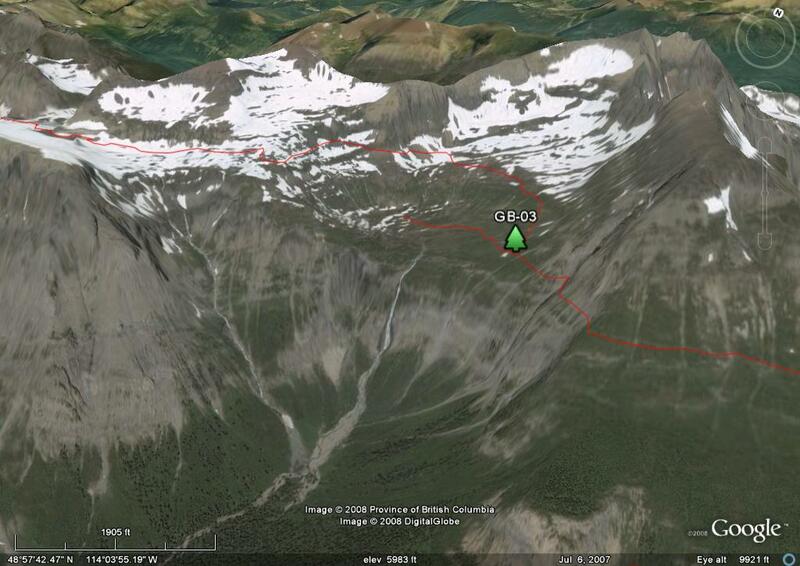 The yellow line is a trail over Starvation Ridge that we never saw. Designated camp sites are marked with a green “^”. Trip Mileage Table: Click here to view or download trail mileage table (pdf). Trail mileages in the narrative include trip to and from Hole in the Wall camp. Trip Video: Click here for the trip video. GPS File: Right click this link to download the track in a gpx format. Save it to you computer and use your GPS software to load it to your GPS. If it exceeds your saved track capacity, you will need to break up into more digestible bites. 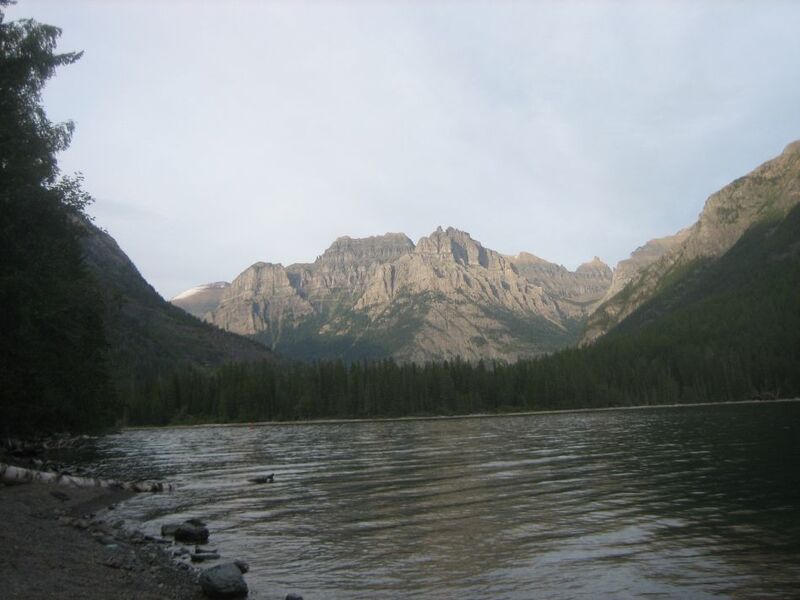 The Bowman-Kintla Hike: Bowman and Kintla Lakes are located at the very north west corner of the park, approaching to within 2 miles of the Canadian border. To get there you need to navigate dozens of miles of gravel roads. High clearance vehicles are not mandatory, but after seeing the oil trail left by a cracked pan, we were glad we rented an SUV. Since this is a point to point hike, a shuttle is necessary. 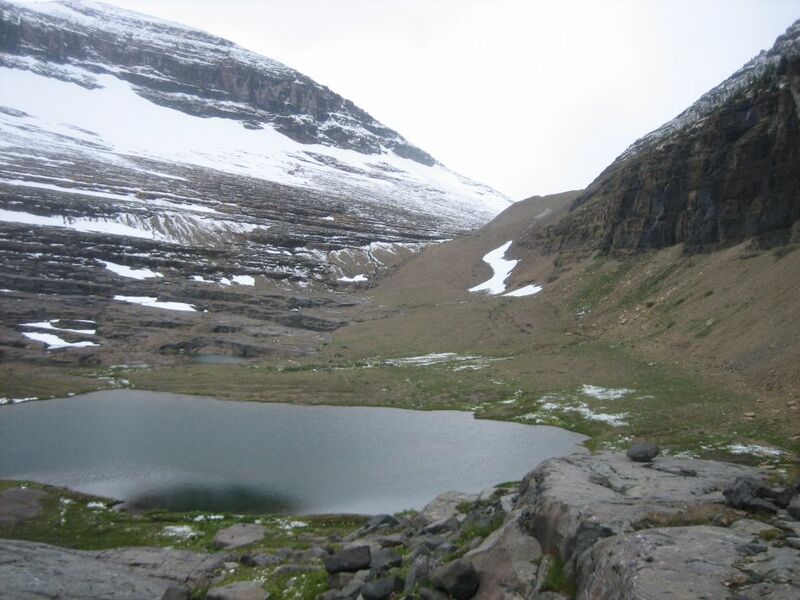 The park service has left you to your own designs because 1) they don’t have shuttle service like that available across Logan Pass and 2) they do not allow any commercial vehicles or outfitters to travel to Kintla Lake. 1) Our back up was to call around to some of the stores in the area and try to find a seasonal employee who want to make a little cash. 2) On our first trip to Bowman-Kintla in 1981, Robin dropped us at Bowman, drove to car to Kintla and hitched back with a garage truck. He said it was the only vehicle he saw. This time it should have been easier, given the number of vehicles we passed between the two trailheads. 3) We met a young lady doing the hike solo who parked at Kintla and rode her bike back to Bowman. That is something like 20 miles on gravel roads. Considering our speed in the car and her daily mileage on the trail, it probably didn’t take much more time than it did with the car. A lot more energy, though. 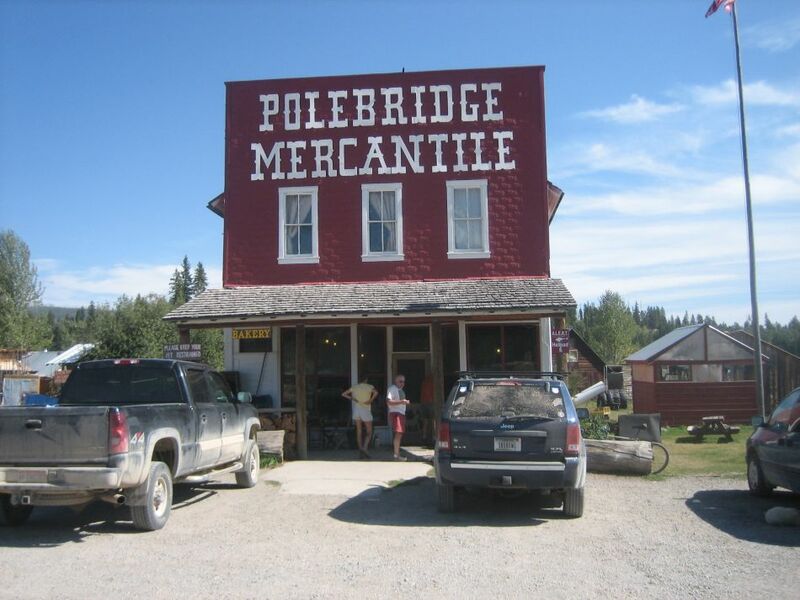 4) Stop at Polebridge Mercantile and try to solicit a ride with one of the many visitors. 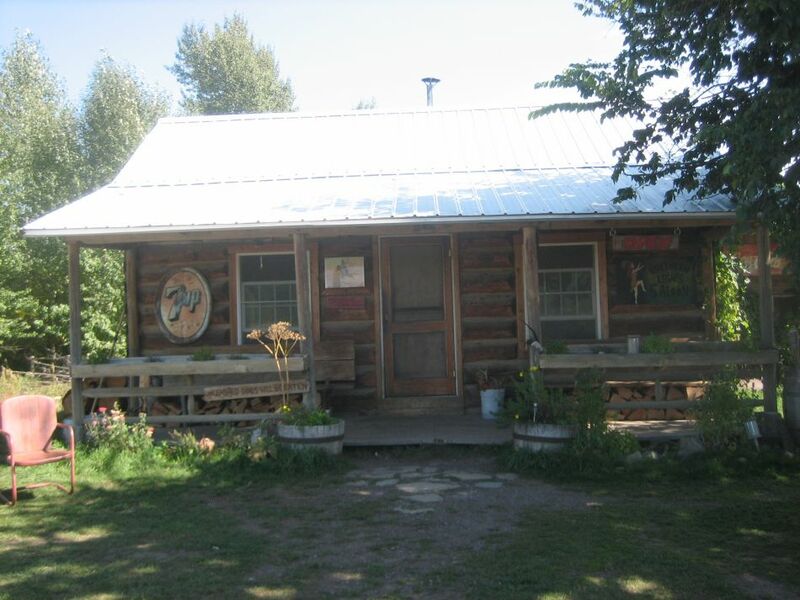 Speaking of Polebridge, whether on the way to the trailhead or on the way out, treat yourself to some of the excellent bakery goods at the Mercantile. They have pocket bread sandwiches to die for and a decent selection of bottled beer to wash it down with. If you get there after 4 pm, the Northern Lights Saloon will be open. If you are there on a weekend evening, they may even have live music. 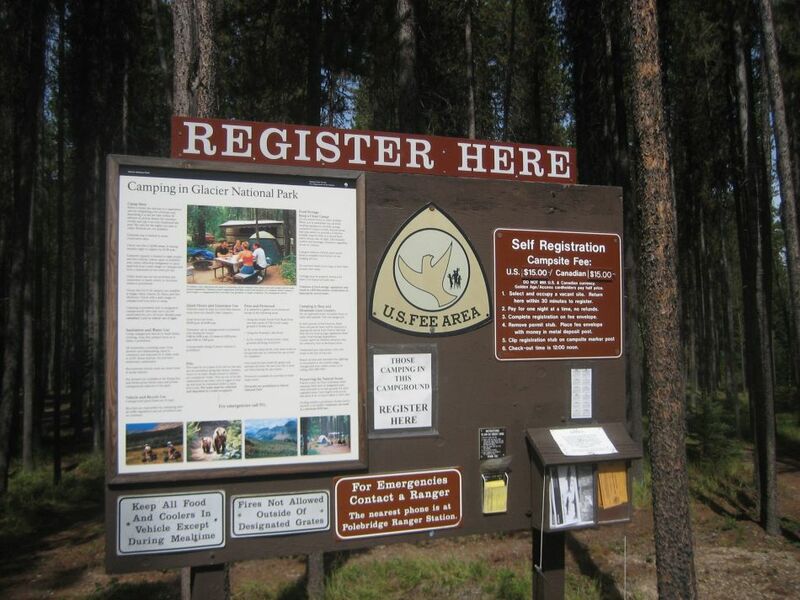 The parking lot for the Bowman Trailhead (N48.82873 W114.20198) is along the main campground road next to the self registration bulletin board for car campers. Follow the spur trail through the lodgepole pines to the lake to the trailhead sign (no parking here) and turn left on the road bed. Stay on the road trace until a trail splits off to the right. The trail will pass the ranger cabin and then pass the Bowman Lake Trail sign announcing the Upper Bowman Campground in 11 km. 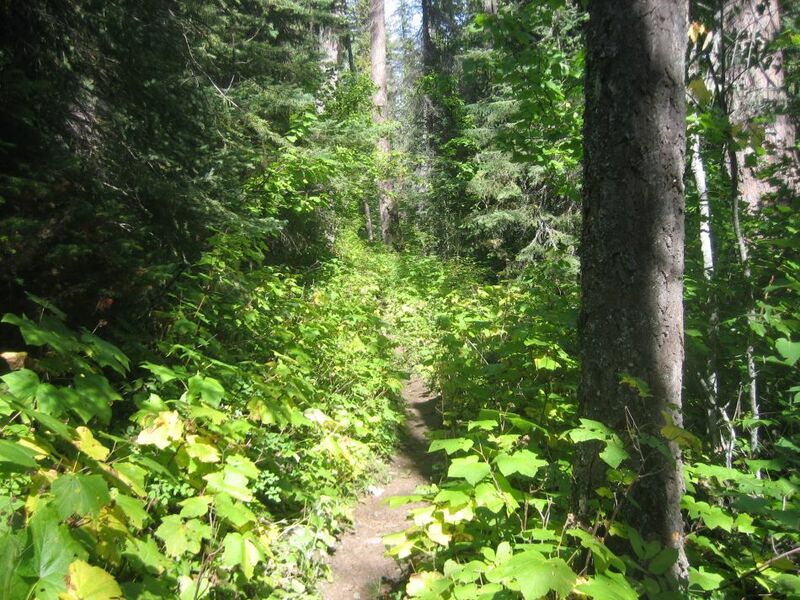 The trail to the campground follows the north side of the lake going through a thick montane forest dominated by Douglas fir. The first half is set away from the lake. It is brushy and often underlain by a slick black mud. Thimbleberries abound but if you look close you will see an even bigger leaf that looks a little like it; it’s a devils club. If you aren’t sure what it is, feel the underside of the leaf or the stem and if you pull your hand away with it pin cushioned with prickers, its devils’ club. 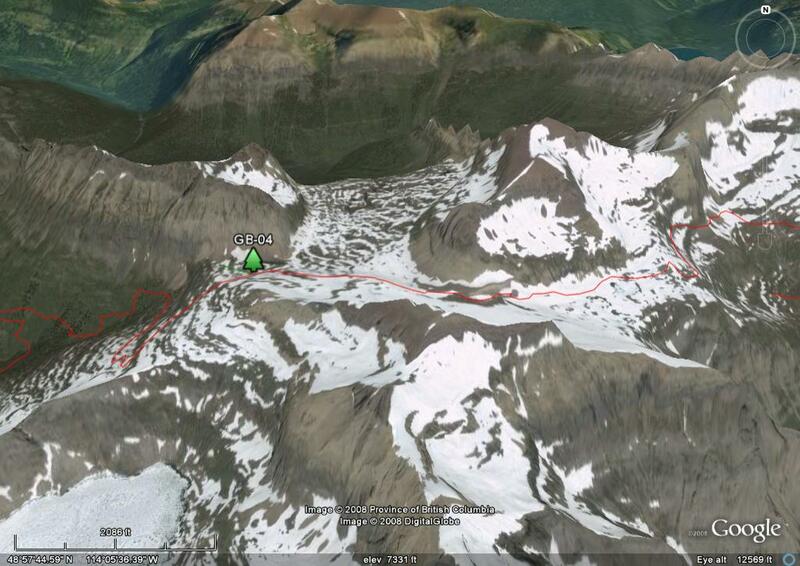 At 0.8 miles there is a junction with the Numa Ridge Lookout Trail (4.9 miles and 2,900 feet to the top). At about 3.2 miles, the trail comes with in a few feet of the lake shore and there is a nice gravel “beach” fit for a break and a view. The rest of the trip to the campground is closer to the shore in a more open forest with regular view of the lake. The trail has some minor ups and downs. 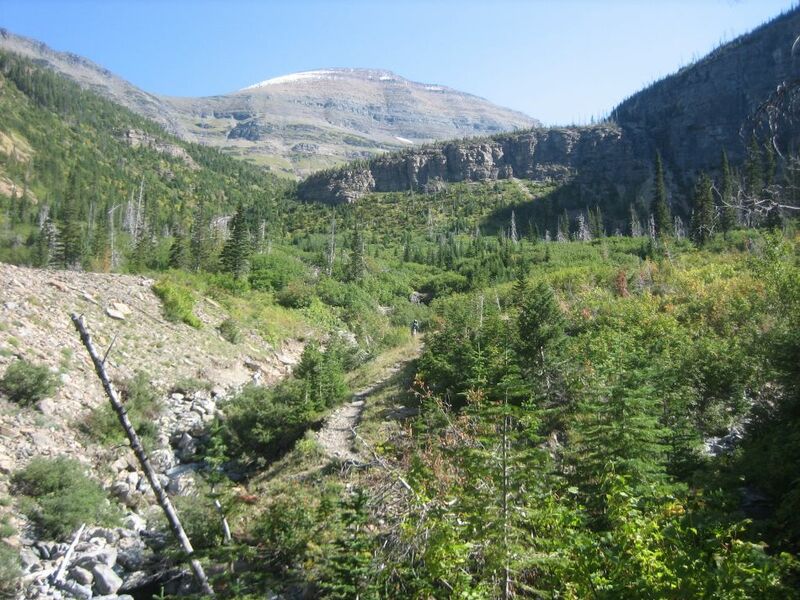 At 7.2 miles the trail crosses Numa Creek and a few feet later reaches the junction with the Bowman Campground spur trail (GB-01, N48.90422 W114.12128). The food preparation area consists of a big log quadrangle for cooking and a similar one with a fire ring. The best campsites are the two to the south across Numa Creek. They are in open forest with a view of the lake. There are several others to the east. All are north of the campsite trail in dense forest. The pads are bigger than those in the Gunsight Pass Trail and have a combination of gravel and forest litter on the tent pads. The campsite trail continues past the last site and eventually intersects the main trial. When we were there in 2008, there were signs on the spur trail and buoys on the lake to limit access to the area north of the last pad because of eagle activity. The trip to Brown Pass begin level and finishes with a climb. At 7.6 miles cross an unnamed creek coming down from Mt Peabody. There is no bridge but we made it across with seven dry feet. Then it is back into the woods until mile 10.6 where you cross several channels of Pocket Creek. The first was a dry bed. The second had a small stream but judging from the bridge they are building, it looks like it may get some higher flows. About 0.15 miles further is the Bowman Creek crossing where we found it dry and full of cobbles. To the north you can see the waterfall coming over the edge of the world from Hole in the Wall. Now the climb begins. The first part included some high bushes, sometimes head height. The location of the trail placed it in the morning shadow and as a consequent, it was wet with dew and we were drenched. The trail was also fairly steep, especially considering how graded most of the trails in the park seemed to be. 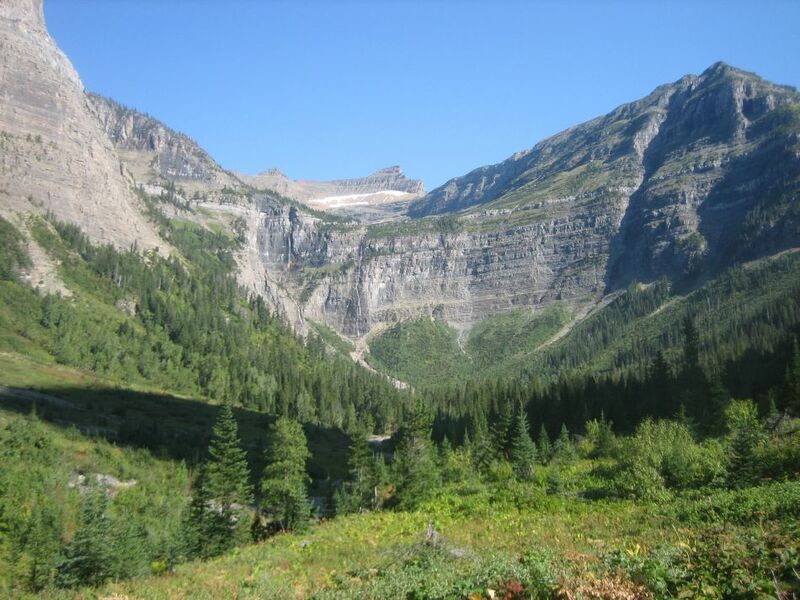 At about 12.5 miles the trail crosses the creek that drains from Brown Pass and scrambles ups a small moraine. 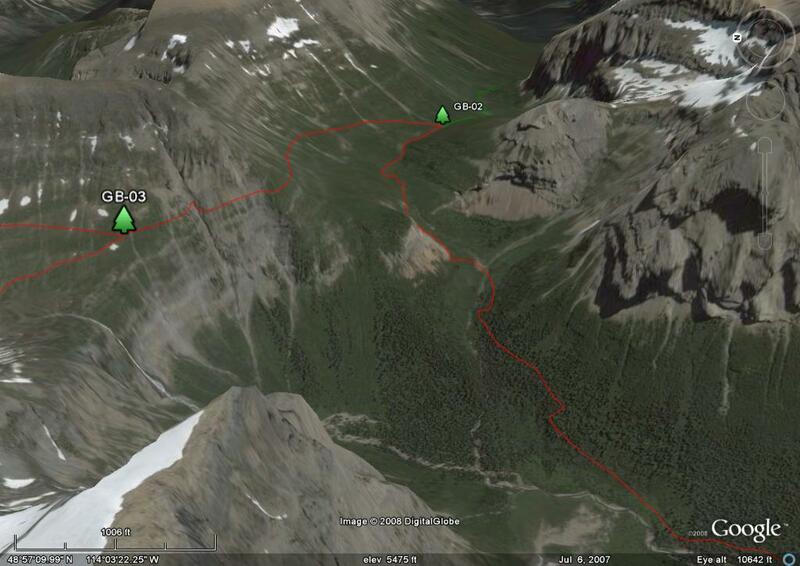 After a series of switchbacks the trail crosses a small waterfall and then finishes the climb to Brown Pass. Brown Pass camp is in the trees on the south side of the trail about 0.2 from the Brown Pass Trail Junction (GB-02, N48.95071 W114.03561). We ran into three back country rangers at the pass who told us about a grizzly that they saw the previous day below the trail to Hole in the Wall. All three were retired and just seasonal workers, which sounded like a great gig to have. One of them, Ranger David, was heading to Hole in the Wall to measure the amount of trampled area around the camp site so we would see him again, soon. Okay, maybe that part isn’t so great. We hiked a little way up the trail to Hole in the Wall, found water and took a lunch break. 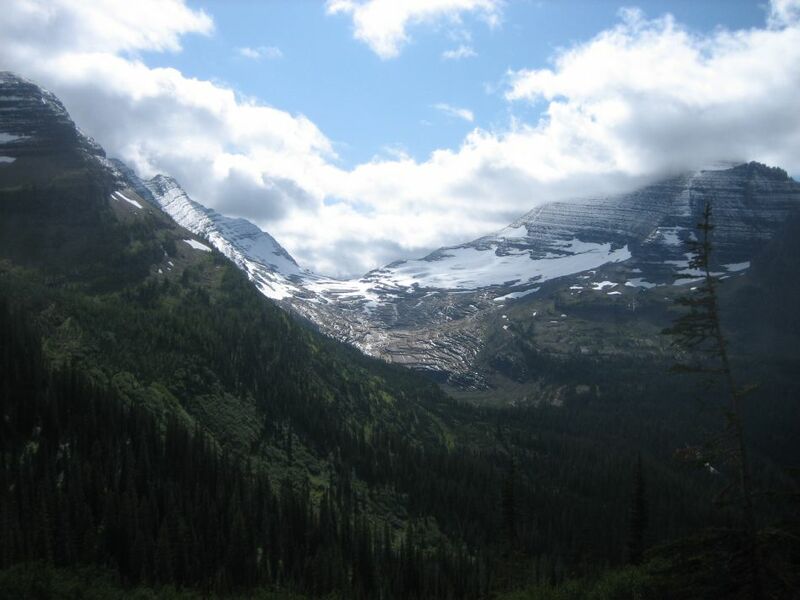 It was a stunning view of the Hawksbill and across Brown Pass, across the valley to Thunderbird Glacier, down Bowman Valley towards the lake and back to the east to Boulder Peak. Below us was the area where the rangers saw the grizzly, but we saw no signs. A little further and the trail swings to the north and cuts into the side of the cliffs of the Helena (Siyeh) Formation. 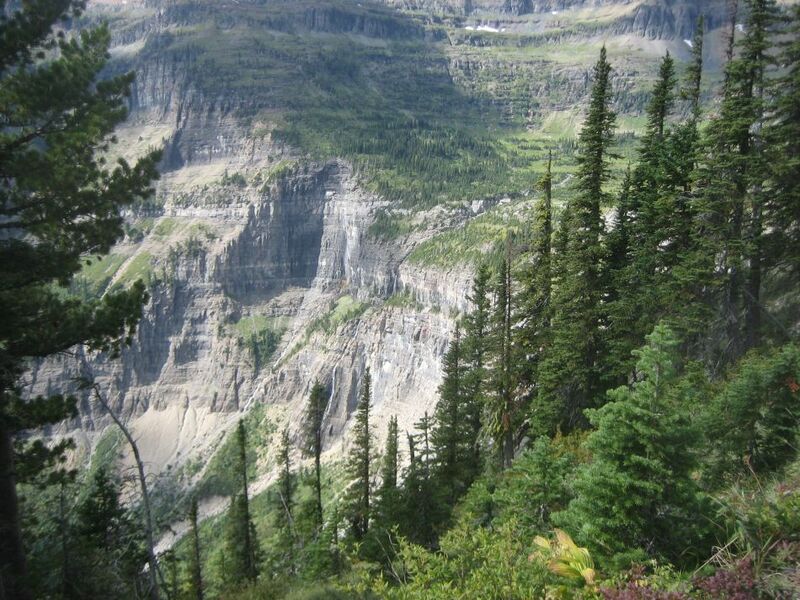 Although the path is fairly wide and perfectly safe when it is not covered in snow, the 2,000 foot drop into the valley can be challenging to those of us with a fear of heights. It doesn’t last too long and soon you pass over the lip of the Hole in the Wall and hit the spur trail in the Hole in the Wall camp (GB-03, 15.4 miles, N48.96268 W114.05916). Hole in the Wall is a verdant hanging valley. The back rim features cascading waterfalls. Above them are the ridges of Mt Custer with its talus slopes and snow field and Boulder Peak. 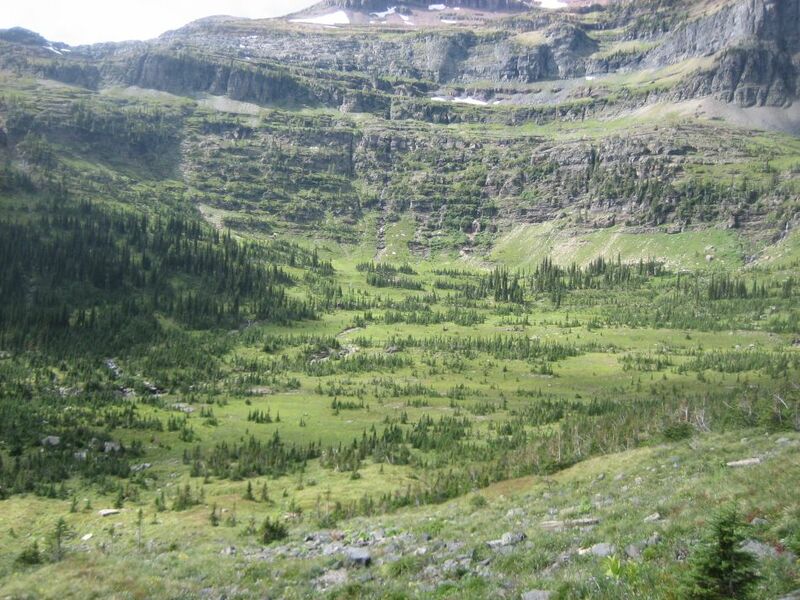 Covering the basin are alpine bushes and grasses and subalpine firs. Out to the south past the edge of the world are spectacular, though distant, views of the Thunderbird Mountain and Weasel Collar Glacier. 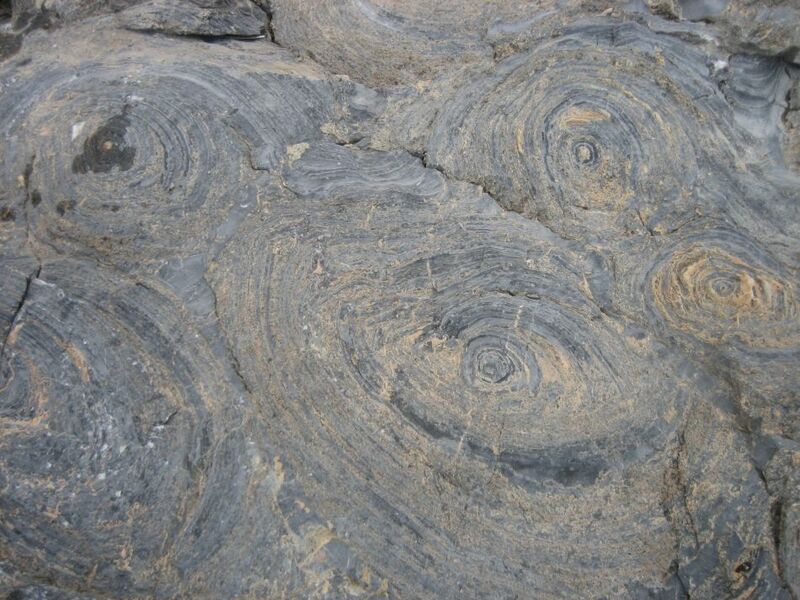 For those interested in geology, Helena limestone in the ravine near where Hole in the Wall Falls begins, has some excellent the exposures of 1.1 billion year old stromatolites. When talking to people who have been there, it always ranks near the top of their favorite campsites. While we were setting up camp, the Ranger David came down from the food preparation area expressing with urgency that we needed to get our food hung, NOW. Though this seemed a little extreme, after all we just got there and were basically in the process of pulling out our food, we later learned from the next set of hikers to arrive that a grizzly had past the north edge of the camp and climbed the back slope of the valley to a higher valley. Did Ranger David see the bear and not tell us? (Here is a question for your next campfire. Should the ranger stay silent so that you don’t go running to see the bear and cause a problem or should he let you know so you can be aware of the proximity of a potentially dangerous animal?) The bottom line was we didn’t see it until later in the evening when it was browsing on the east slope of the valley. Evening brought rain so dinner was under the tarp. During the night the wind and rain coming up the valley shook the tent and kept bringing up the same old doubt, “maybe I should have brought my four season tent.” Morning came and the super light Big Agnes SL3 kept us dry again. The sky was gray with low clouds and the cold wind was carrying snow. There was a rim of white above the Hole in the Wall valley. Our next leg would take us another 1,170 feet higher to Boulder Pass and it was obvious from the snow we could see that there would be snow on the pass. A lot or a little, that was the question. A split of opinions as to how navigable it might be kept us in camp until a hiker from Boulder Camp arrived announcing the snow was less than four inches and melting. 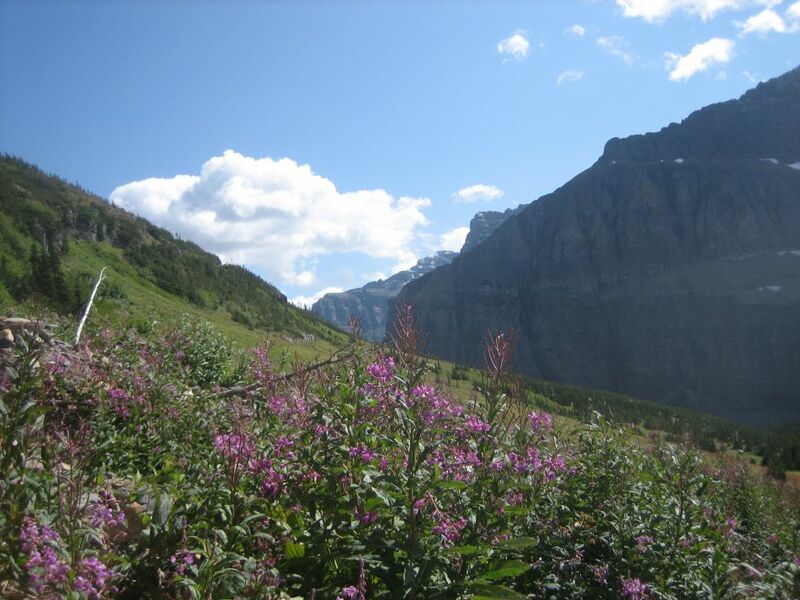 The hike to Boulder Pass is varied and special. It starts with a climb out of the valley and then a hike along the upper rim. About half way around the arc of the valley the trail shifts back to the wall of an upper hanging valley and climbs along the talus slope. At the top the trail is marked with cairns as it climbs up a series ledges. Then it descends into a small basin with several lakes where you can see the stair steps of sedimentary layering climbing to Boulder Glacier. One more ascent up another talus slope and you gain the pass (19.9 miles) and get your first glimpse of hanging valley at Boulder Pass. Boulder Valley used to be my favorite campsite. When we were there in 1981, there was no food preparation area or tent pads. 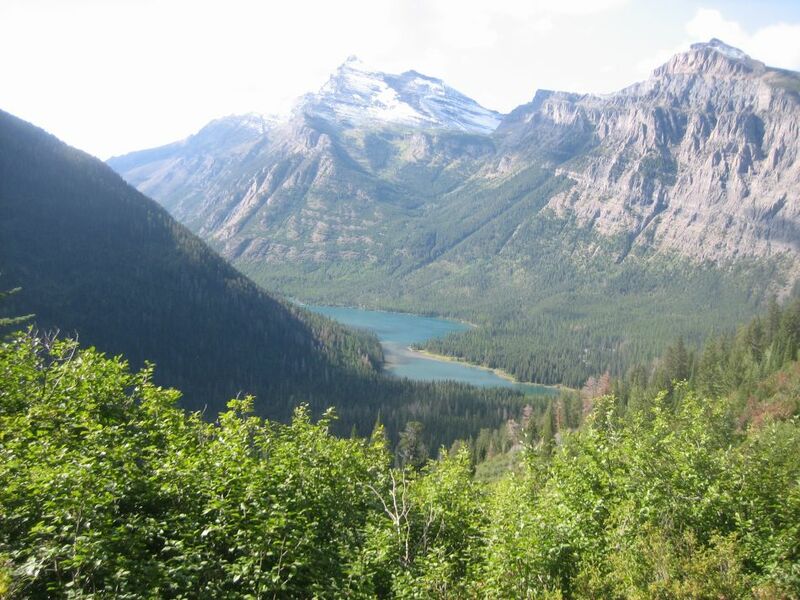 The valley was lush with grass and dotted with smooth, glacially striated boulders and dozens of ponds filled with melt water from Boulder Glacier. The day we got there was warm enough to try a heart stopping dip and the night was so clear the fog of Everclear couldn’t even stop the stars from lighting the sky. The next morning was cold an crisp, ripe for an assault on Boulder Peak. Boulder Valley is still mystical, and the boulders are still there. Now there is a campground about 0.1 miles north of the camp spur junction (GB-04, 20.4 miles, N48.96313 W114.10232) and the food prep area and three tent pads have taken away some of the magic. To make thing worse, because it was still gray and spitting snow, one of our crew was concerned about the weather and his gear and insisted we head for lower elevation. Talk about frustrating; I had been looking forward to Boulder for 27 years. Of course within an mile of leaving the pass the sun came out, it warmed to shirtsleeve temperatures and everyone regretted the decision to keep going. The Kintla Creek crossing is on a bridge that has no trail on the other side. Turn left, follow the streambed and watch for cairns and ribbons. Back in the woods for another quarter mile and you will intersect the spur trail to the Upper Kintla Campground (GB-05, 26.0 miles, N48.98071 W114.15357). The campground has four tent pads near the lake shore, a food prep area and a fire area. If you follow the campground trail to the northwest, you will pass the hitching post for stock and ultimately intersect the main trail. The lake has a nice gravel beach that makes for a nice walk or a place to dry your gear. The hike to the head of Kintla Lake is 5.3 miles. 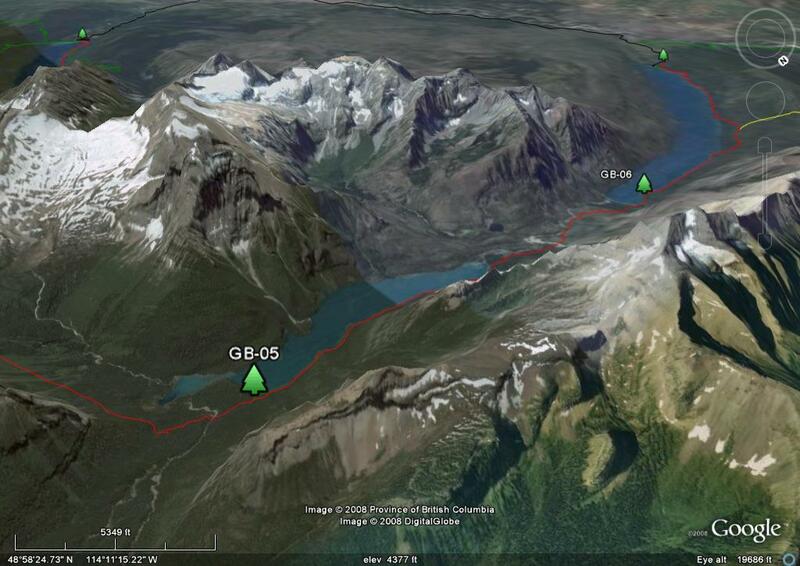 The first 2.6 miles is along Upper Kintla Lake. The walk is level and close enough to the lake to get regular views. The forest is predominately Douglas Fir and Engelmann but you may see an occasional western larch. 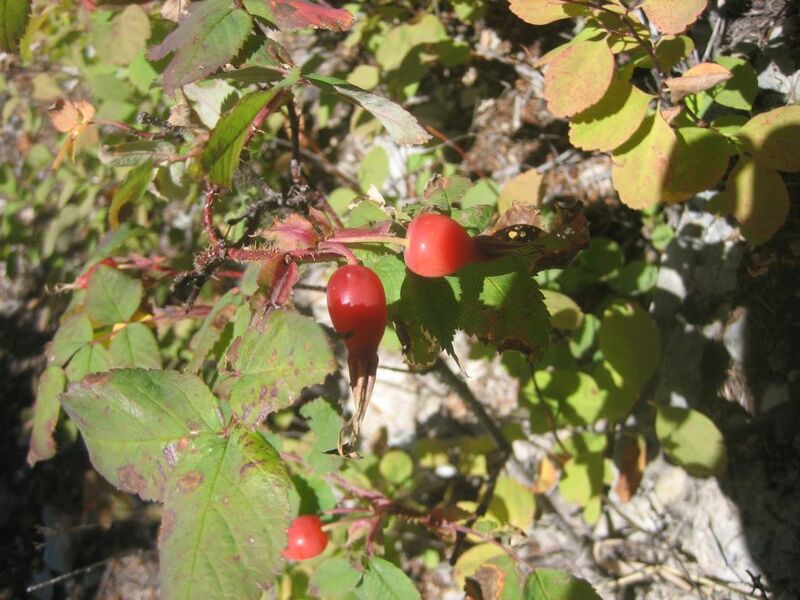 We also saw quite a few tomato like berries that are actually the rose hips of the woods rose. Across the lake you may see some burn areas from the 2003 fire. This is the same fire season that took out the entire forest on the north side of Lake McDonald. 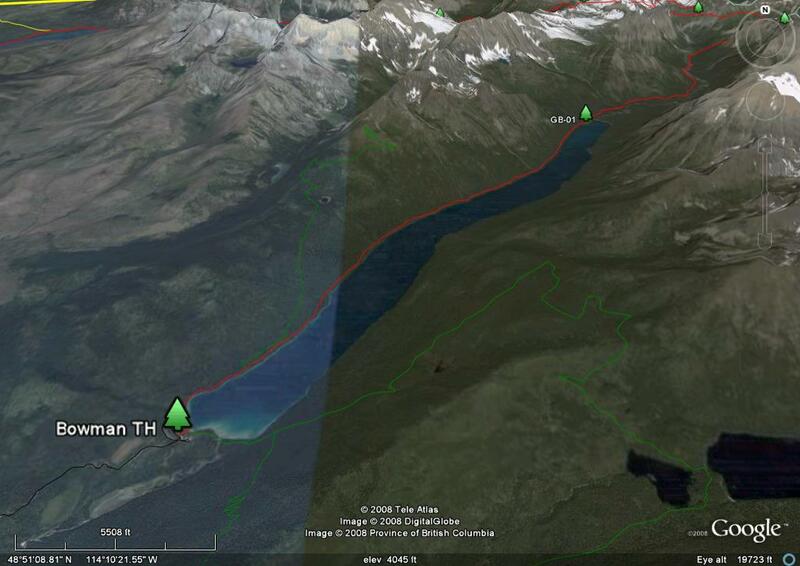 Past the end of the lake you will catch a couple of glimpses of Kintla Creek and then cross gravelly Long Knife Creek. On the other side of the clearing you will enter a burn area and soon be walking around the hills a complex moraine. 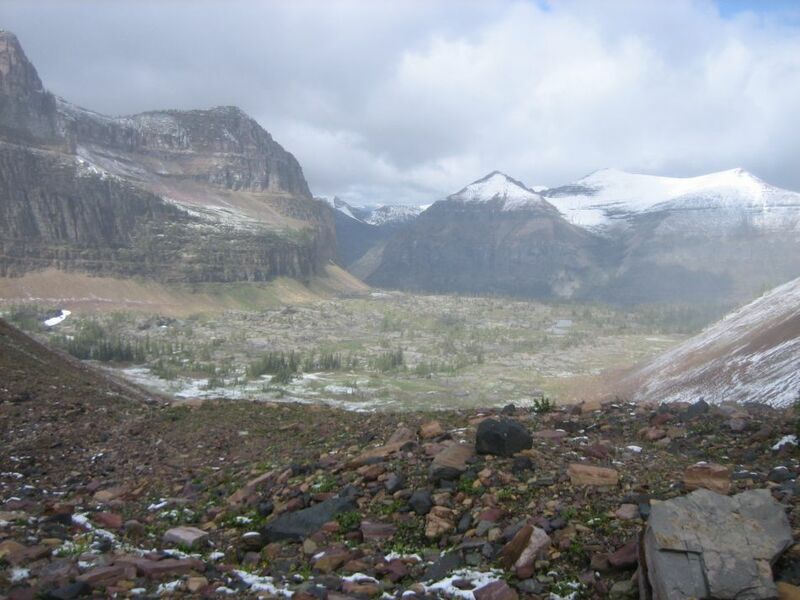 The old Kintla patrol cabin is at 31.0 miles and the trail cuts through the middle Kintla Campground at 31.3 miles (GB-06, N48.97596 W114.25301). Kintla Campground had six pads, a food prep area, a fire area and a hitching post. On the gravel beach is an old metal precipitator and in the lake are milled planks and a three foot iron collar or flange. 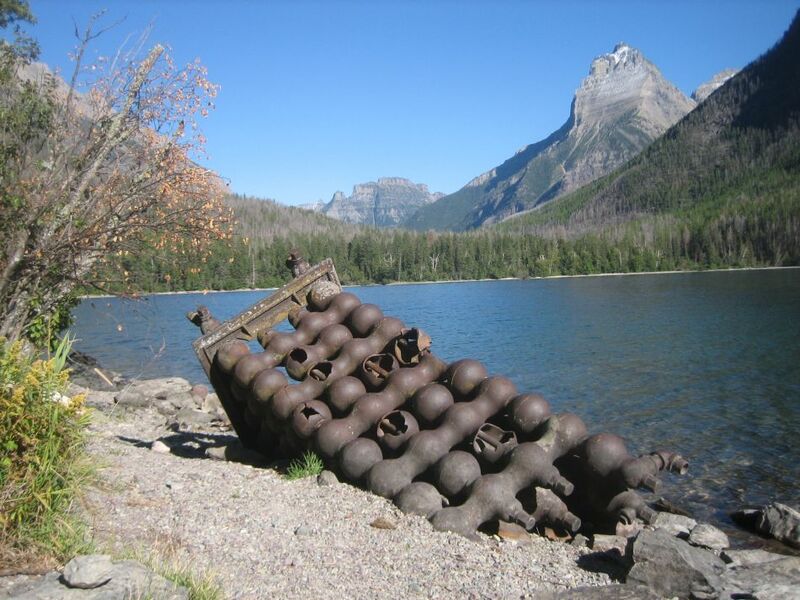 According to the park, these were all associated with the Butte Well, an oil well drilled in 1901. 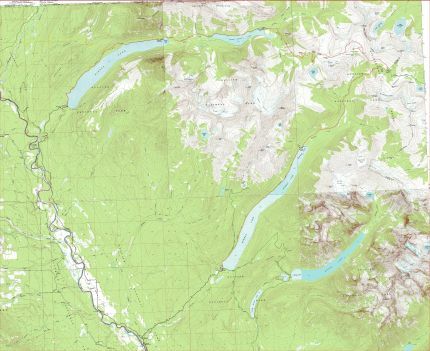 After prospectors found an oil seep at the head of the lake, Butte Oil Company put in a 40 mile road from Lake McDonald and when winter came, dragged all their equipment over the ice. The precipitator is used to separate water from oil and it is often done at the well or at the collection tanks to avoid the cost of shipping water. Since the well never produced it seems likely that it was brought in before production because that would be the only opportunity until the next winter. The hike to the Kintla trailhead is 6.7 miles. The first 1.5 miles is level along the lake shore. Evident here are the results of the “no burn” forest management philosophy that has dominated the forest service for generations. There are extremely dense areas of down and dead trees just waiting for the next forest fire. When those catch, there will be a crown fire in the making. At 32.8 miles, the trail inexplicably climbs 300 feet. The topo showed a trail junction at 34.0 miles, and although we could have blown right by it, no one recalled seeing it. At 37.6 miles, the trail splits with the left fork following the lake to the drive-in campground and the right fork meandering in the woods for another 0.4 miles until it intersects the Kintla road and the trailhead parking lot (38.0 miles, N48.935179 W114.35270). To Buy Map: This map is FREE. Click on image to access full size map and download it.